Stunning off road trip through one of the most unique regions of the globe, the Route of Emotions – Jeri, Delta and Lençóis. 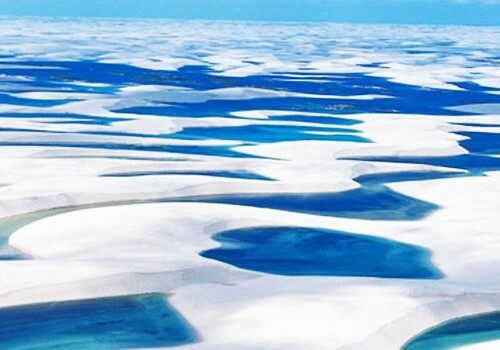 Fantastic landscapes such as the Brazilian “desert”, filled with crystalline lagoons, the only open ocean delta in the Americas and one of the most beautiful beaches in the world will be visited in this itinerary, which includes ecotourism, adventure, sun & beach, culture and gastronomy. Three Brazilian states will be covered in modern 4×4 vehicles and speedboats, having numerous OPTIONAL activities such as hiking, horseback riding, panoramic flights, surfing, kite and wind, bird watching and wildlife and experiences with local communities. * Accommodation with breakfast in the chosen category. 1 night in Fortaleza, 1 night in Guajiru, 3 nights in Jericoacoara, 2 nights in Barra Grande, 1 night in Parnaíba, 1 night in Atins, 1 night in Barreirinhas, 2 nights in Santo Amaro, 1 night in São Luís, 1 night in Fortaleza. Among destinations: Between destinations: Transfers Fortaleza / Guajiru (private), Guajiru / Jericoacoara (private), Jericoacoara / Barra Grande (private), Barra Grande / Parnaíba (private), Parnaíba / Caburé (private), Caburé / Atins Barreirinhas (private), Barreirinhas / Santo Amaro (private), Santo Amaro / Sangue (private), Sangue / São Luís (shared). Guajiru*: 4×4 tour through the beaches of Ceará such as Preá, Icaraí da Amontada, Apiques, Caetano, Baleia, Mundaú, Trairi, Lagoinha, Cumbuco and Icaraí, among others (private). Jericoacoara: Off-road tours of Lagoa Azul, Lagoa do Paraíso, and Pedra Furada (private), Tatajuba (Lago Grande) (private). Barra Grande: Canoe ride and horse-drawn carriage for observation of seahorses (shared). Parnaíba: Boat trip to the Delta of Parnaíba – Delta Cruiser with flock of Guarás (private), panoramic tour to the beaches of Piauí East and hairstyle (private). Barreirinhas: 4×4 ride to the best lagoons of the station (shared), Speedboat ride along the Preguiças River with a visit to Vassouras (private). Santo Amaro: 4×4 ride to Lagoa da Gaivota, Espigão and Betânia (private). Flight São Luís – Fortaleza. *Only in the Jericoacoara-Guajiru-Fortaleza option for the beaches: 4×4 tour through the beaches of Ceará such as Preá, Icaraí da Amontada, Apiques, Caetano, Baleia, Mundaú, Trairi, Lagoinha, Cumbuco and Icaraí, among others – there may be changes of order and course as a result of natural conditions (private). ATTENTION: All the services of this script are in Portuguese (Brazil). For inclusion of bilingual guide services, the amount is R $ 500,00 per day, totaling R $ 7,500.00 for a 15 day and 14 night itinerary. a) All Eco Adventure Tour scripts are customizable. Delete, substitute or add hotels, tours and transfers at your convenience. b) Rates not valid for and holidays. c) Luggage limit of 23 kg per person. d) Some of the establishments in the region do not accept credit cards as payment. It is necessary to always be with a sum of money. e) Passages by air mesh availability. The values of tickets sent are based on online quotes that may change at any time. Only ticket issuance guarantees value. f) Informed flights subject to connections or stopovers according to availability. Arrival in Fortaleza and transfer to the hotel. 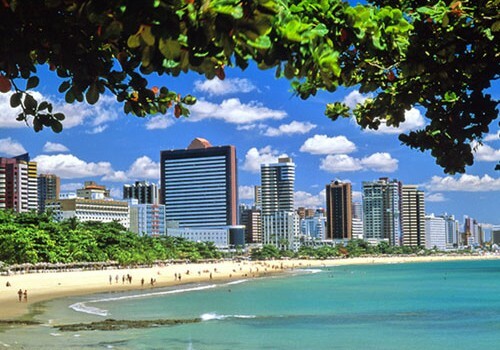 After breakfast, we will continue to the beaches of Icaraí and Cumbuco, still in the metropolitan area of Fortaleza. 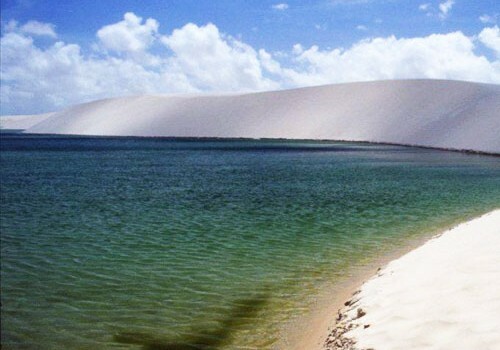 We will also visit the beautiful beach of Lagoinha, postcard of Ceará and visit Barra do Trairí by ferry that will take us to Guajiru beach where we will spend the night. After the coffee, we will continue our adventure by the sea to the sands of Mundaú, crossing by ferry to Baleia, Caetano, Apiques and Icaraí da Amuntoada. We will pass through several small cities like Itarema and Acaraú and we will reach the Prea Beach, from where we will continue along the seafront to Jeri. 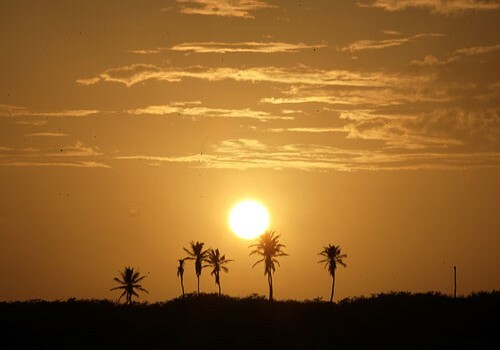 Throughout this stretch of coast the blue sea, the dunes and the coconut trees will guide us through small colonies of fishermen interspersed by sophisticated beaches with their luxurious constructions, in an exciting landscape that is typical of the coast of Ceará. This day can change in the course and in the times of stop for photo, bath and lunch due to the table of the tides. The overnight stay in Jericoacoara will give you a chance to enjoy the village’s nightlife, its restaurants, shops and bars. 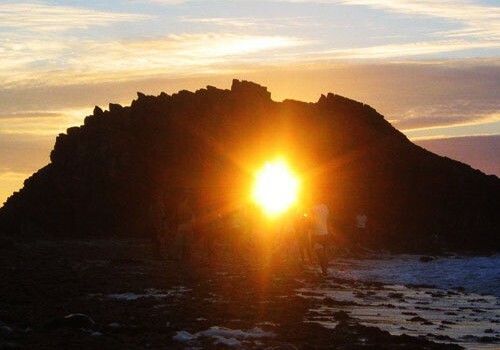 JericoacoaraAfter breakfast, off-road tour to the Paradise Lagoons and other seasonal ones, with a visit to Pedra Furada, postcard of Ceará, which we will reach in a 15-minute walk from Duna do Serrote. In the Paradise Lagoon, the vibrant color of the place refers to the Caribbean paradise: fine, extremely white sand is mixed with the green of the undergrowth and the coconut palms that in turn frame the turquoise blue of the crystal clear water. Excellent structure of bars and restaurants. Overnight in Jericoacoara. We saved this day for Jericoacoara, great for light walks through its sandy streets full of small shops. You can also take walks to the surroundings in quadricycles or horses, in addition to the excellent sea bath, mainly on the beach of Malhada, which has small natural pools of warm water formed on the stones. If you prefer, just lie on the sun loungers and let time pass you by. After breakfast, we will continue along the Jericoacoara waterfront to Barra Grande. We will make our first ferry crossing on the beach of Guriú, with its canal of green waters and the cemetery of mangrove trees. The 4×4 will follow the waterfront to the beach of Tatajuba. At Lago Grande we will delight you with the redinha on the water and with the curious live menu of Didi’s Restaurant. Always on the seafront we will continue to the white sand dunes and carnaúbas of the island of Love, we will cross by ferry the Foz do Rio Coreaú to Camocim. We will travel 115 km of asphalt to Barra Grande, a charming beach with clear and calm waters, a paradise for kitesurfers from all over the world, who come in search of the trade winds that blow there without ceasing. We will experience some of the natives’ way of life with the delightful canoe ride and seahorse-watching buggy in the Rio Cardoso estuary. There is the possibility of a visit to Cajueiro Rei, the largest in the world (not included). The tide table will determine the times of each tour on this day. Overnight inBarra Grande. We saved this day in Barra Grande for a nice light walk through its sandy streets or its large beach with bars and restaurants. If you prefer to spend the day between kite surfing and stand up classes. At the end of the afternoon, have fun in the typical bars and restaurants of the area. After coffee, free time to enjoy the beach of Barra Grande, from where we will then go on a scenic tour through the beaches of Atalaia, Coqueiro and Maramar to the picturesque Tree Hairstyle. 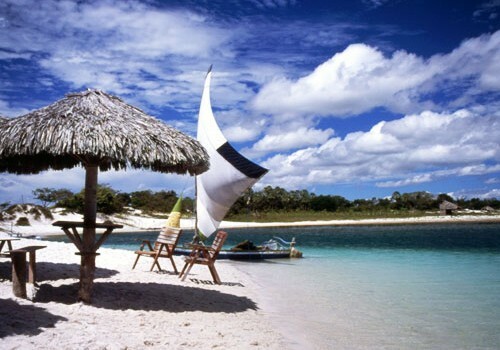 We will also visit the Portinho Lagoon, postcard of Piauí. After lunch (not included), we will embark at the Port of Tatus by speed boat through the majestic labyrinth of islands of the Parnaíba Delta towards Caju Bay and Guarás Island, where we will stop at Morro do Meio for a quick walk on the giant dunes of the Caju Bay and a dip in the waters of Parnaíba river. The beautiful bird of the guará name with its plumage of a bright red can be seen the hundreds while they perch at sunset (the sighting of animals depends on several factors conjugated), in a rare and unforgettable spectacle. 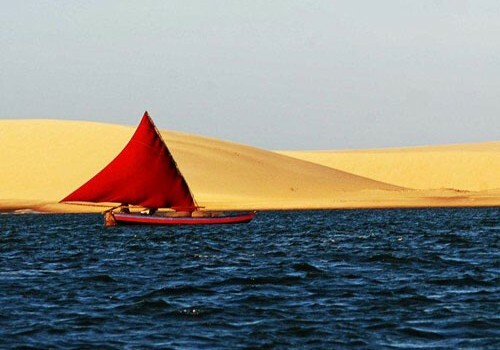 At one point the traveler is surprised by an important historical personage of the Delta of the Parnaíba, in this exclusive, experiential and theatrical tour, “transporting” it to the beginning of the XVIII century. We will return to the Port of Tatus, where we will be transferred for fifteen minutes to the hotel in the city of Parnaíba, a beautiful city with a good structure of bars, restaurants and nightclubs. After breakfast and already on board 4x4s, we will take the 110 km of asphalt to Tutóia, crossing the border of Piauí with Maranhão, where is located the Jandira Bridge on the Parnaíba River. In the town of Comum already in Tutóia, we will take the asphalted road that will take us to Lagoinha and from there until Paulino Neves that shows its streets of white sand and its wooden bridge over Rio Novo river. We will make a small photo stop at the Oásis do Rio Novo, the beginning of the Pequenos Lençois. Deserted beaches, fields and dunes make up the landscape in this part. Arrival at the village of Caburé and its rustic inns and restaurants. We will cross the Preguiças to the village of Atins where we will spend the night. After breakfast, and with ready bags, we will continue by speed boat to Barreirinhas along the Preguiças river. 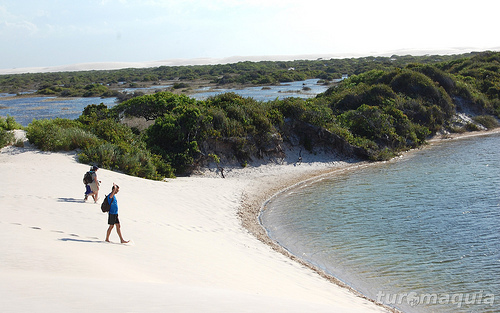 We will continue by boat to the Vassouras, one of the many points where the dunes of the Pequenos Lençóis meet the Preguiças river. Monkeys and parrots make the feast of tourists stopping to refresh themselves with icy drinks served to the shadows of the tents. Continue along the Preguiças river. On the banks, palm trees and mangroves are home to birds, reptiles and mammals. 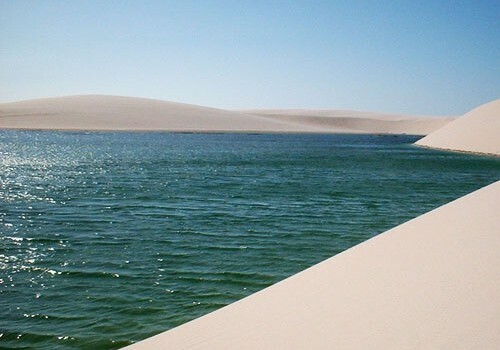 After check in and lunch (not included), stroll to the impressive Lençóis Maranhenses National Park. On board the 4×4 we will cross the Preguiças River by ferry, take the sand tracks for approximately 40 minutes to the best lagoons of the season, an irresistible invitation for a dip. Before returning to the lodge, we will experience the sunset in Lençóis Maranhenses, one of the most remarkable experiences that nature can provide. After coffee, we will continue along asphalt and sand tracks in approximately 3 hours approximately to the bucolic Santo Amaro, scenery of the movie Casa de Areia. We will be welcomed by the transparent Rio Alegre, which embraces the city along with the coconut trees and the dunes. After check in and lunch (not included), private 4×4 visit to Lagoa da Gaivota, passing through the region of lakes and fields. We will walk on foot the dune that will give us a splendid view of the Lençóis, having the magnificent Lagoon of the Gulls at our feet. Worth a walk through the dunes and a swim in the translucent waters awaiting the fantastic sunset. Overnight in Santo Amaro. After breakfast, we will visit one of the most untouched and impacting regions of Lençóis Maranhenses. We will begin with the Espigão, a region of long and high dunes that divide our attention with the beautiful Rio Alegre and the rich vegetation of the place. We will continue to the magical village of Bethany on the banks of its lagoon, where we will make a pleasant canoe trip to the gigantic dunes on the opposite side. The exuberant and overwhelming nature, the slow way of life of the locals will transport us to an atmosphere of dreams. We will return to Santo Amaro. Free time and overnight. Breakfast. We will leave in 4×4 until the town of Sangue, 3 hours approximately of São Luís by asphalt, which we will travel in micro-buses / van. Transfer in and overnight in the middle of lodging. Breakfast. Transfer out hotel/airport. Boarding to Fortaleza. After aerial, we will continue to the lodging in Fortaleza where we will spend the night. Breakfast. Transfer hotel/airpor. End of the services.